Since I am in the foolish pursuit of having all 100 of the first cars, I needed to add a Wild One to the set. I saw an ad on the site for what was claimed to be the best shelf queen on TC. Right. What I received was a well used, broken, scratched to death, missing parts, badly painted and decaled car. Not so good, and this seems to be the way club sales have been going. My idea of a shelf queen is a car that requires nothing, has no scratches from running and has already had all the details sorted out. At first, member wanted 400 US for the car, and looking at the pictures, which can be very deceiving if taken in the right light, it looked good enough and we settled. Then I was called out on business and forwarded this information, he needed the cash so he listed it on the bay. I bought it for considerably less than the previously arranged price. To date, I have rebuilt the diffs, bearings, cage, alloy tubes on cage, new body, stickers, pressed parts bag, in short, I could have bought a NIB for what I have in this one. I will say it did come with nice tires and wheels. I have run it around a little and like most of the early cars, it handels like rubbish and is slow. I woundered how he had managed to scratch the sides of the cage up so badly, and after driving it, it is easy to see why. The suspension is weak and too short of throw, and it sits high so the center of gravity is too tall, it wants to fall over in a hard turn. However all that said, I like the looks, it is the transition to tub bodies, which I am not all that fond of, but it works and once again is one of the first 100. This one has had its radio removed, something I usually don't do, as I will never run it again. There are still quite a few out there and there is a fair parts supply so far. I would not wait too long to get one as this will change unless the company decides to ruin the collectability of this car by rereleasing it as well. The best thing about the Wild One is the combination of its scale buggy looks and its scale buggy handling. Sure, it is fun to look at its beautiful scale appearance, but only when I saw it drive along the track did I really get excited. This car handles like a real buggy. It does not jump 2 meters in the air and land softly like an Associated or Losi buggy, nor does it drive along the track bouncing all over the place due to under damped suspension as I've seen SRB's do (I never seen SRB's in person, only on TC movies, so excuse me if I got the wrong impression). The Wild One lands heavily after big jumps, soaks most of the bumps on the track (but not all), and understeers a lot, and when you see such a scale accurate buggy drive in such a scale way you really appreciate the way Tamiya designed it. Of all my cars this one got to be the most enjoyable to watch running. 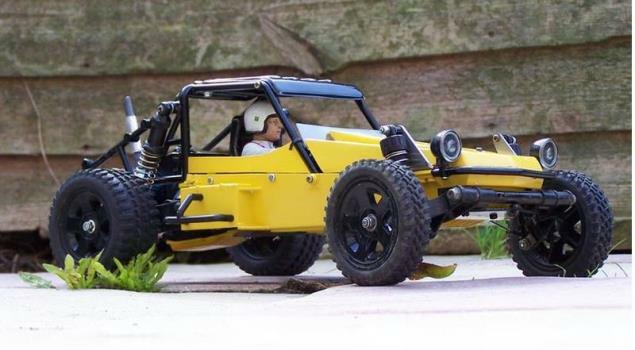 Mechanically, there are some drawbacks in the Wild One design: as mentioned in previous reports the chassis tends to break in the middle section right below the front roll cage connection. I acquired two used Wild Ones and both had a crack in the chassis at this place (and incidently both on the left side). Looking on ebay I have seen numerous Wild Ones with the same problem. However, the car seems to handle fine with this crack, and it doesn't seem to expand or make the chassis easier to break when driving on 'vintage car mode' (i.e. : no head on collisions with solid objects). Another recurring problem are the front shocks, which tend to leak. 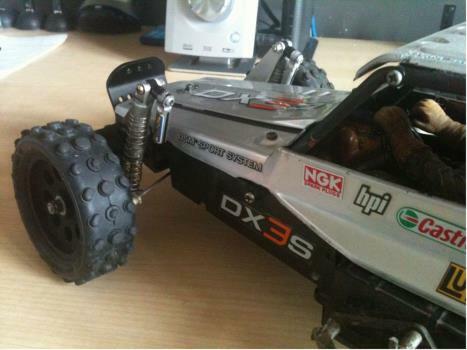 I wanted to remain scale and so did not install any modern shocks, and eventually given up on this problem. I now run my Wild One with almost no oil on the front shocks and frankly, haven't noticed any difference in the front dampening. I attribute this to the fact that most of the Wild One weight is concentrated towards the rear. The rear shocks are quite adequate, and I never encountered any leak. They are the same as the Frog shocks (except for the main cylinder which has a different outer shape) and as the soon-to-be-re-released Frog has modernly redesigned shocks that keep the original shape intact I think it would be interesting to install them on the Wild One to see if they work better. The main drawback of the Wild One is its gearbox. As an effort to reduce r&d costs, Tamiya designed the Wild One to use the Frog/Blackfoot diff gears. Tamiya has done so before (on the HotShot) with no reliability issues but this time, for some reason, the gearbox casing was designed with some play between its two halves, which makes it necessary to install special shims to prevent play. If these shims are installed incorrectly, or if the plastic shim wears out, the play in the diff causes its gears to disintegrate. Using a high power motor (anything stronger than sport tuned) emphasize the problem. This problem can be solved by shimming the diff with thin washer- a lengthy trial and error procedure that involves disassembling the gearbox, installing a shim, reassembling and checking its affect, or by using a (pricey) Thorp Frog ball diff. One more possible solution might be available, again from the Frog re-release. A well known problem on the Frog as well, it is expected that Tamiya would redesign the Frog diff, and since the original diffs are the same, and the re-release Frog gearbox haven't changed, it is expected the new diff would fit the Wild One as well. We'll have to see about that though. It's true what they say. This really was Tamiya's last true buggy. What came next was a mish-mash of shapes. 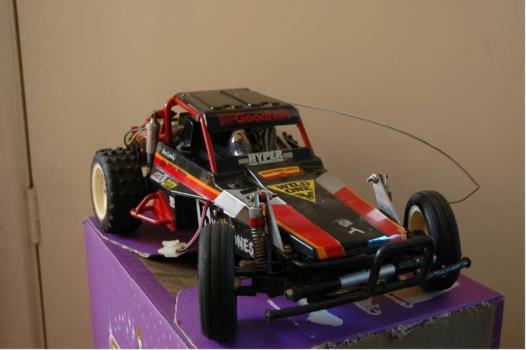 My first Tamiya but not my first choice as l wanted an FAV but l should't have complained. The Wild One was a great improvement over the FAV with bigger wheels and oil filled shocks. Parts availablity was also far better too. The chasis was a bit of a backward step when compared to the past like the Frogs indestructable space frame. A simple bath-tub with appendages dangling from it on each corner and it wasn't that strong. Roll it too many times and plastic fatique would become evident and the chassis would break by the start of the roll cage. The gearbox contained standard Frog type gears and axles. This was mounted via the red roll cage and small brackets to the chassis. The body was in 3 parts, Body, roof and driver. Very weak main body would result in the sides falling off. The moulding of the drivers hands used to make me chuckle, he had the BIGGEST hands. When ready to go it is a hoot to drive and must have been one of the fastest buggies Tamiya had ever made when in standard form. It handled quite well too considering the engine was slung out to the rear and that there was nothing to weigh down the front. This made it a great jumper though. Problems encountered with it was as mentioned, the chassis but this was minor. Rear trailing arms would break if the suspention set up was too hard, The switch was underneath and not protected. A bit of a backward step when up until now, all switches were covered with rubber boots. the speedcontroller was also suseptable to problems with dirt because of its position. It also used to run away. The servo battery box was just behind the driver and with constant battering and use it would fall out and spray the road with AA's and then head off for a wall!!!!!! Tamiya's 50th RC car and some say the end of an era, as after this model the trademark Tamiya realistic buggy was no more, every buggy after the Wild One was more down to Tamiya's artistic licence than taken from the real world of off road racing. 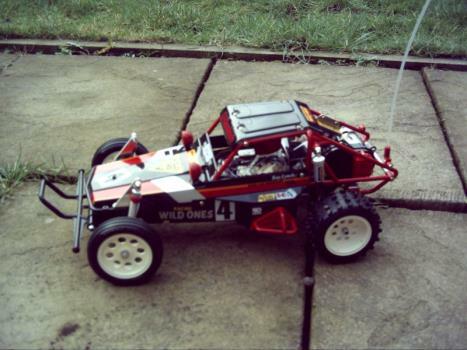 This was the second Tamiya buggy i had when i was 15, i did a paper round to save up enough money for it, it seemed to take ages. The problems i had with this car were mainly its gearbox used to grind gears, there was a small spacer that went in the gearbox that held everything tight and if this got lost then it would strip the three small gears in the centre of the diff. I also got through a few chassis tubs, these used to break in the middle, usually after i'd ran head on into a kerb at full speed! 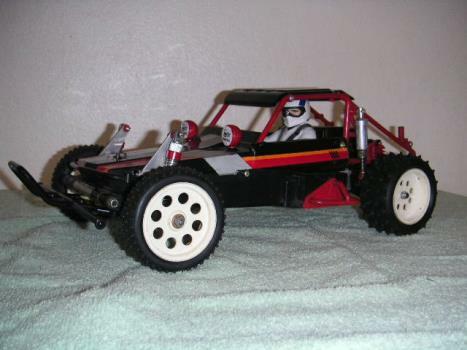 Tamiya's best sandrail frame-tub buggy! 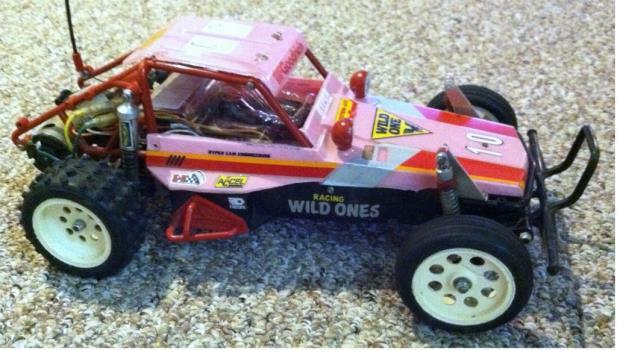 Seriously, the Wild One was a very popular RC vehicle, mainly due to its realism and ample performance. Its ackerman'd steering at full lock is its trademark - no other car is as instantly recognised with steering cocked like so. Tamiya had the smarts to place the motor and MSC's resistor right out in the open - this provided good cooling and reduced beginners' overheating problems.